S2G | What Does S2G Mean? He spent the whole night looking at his phone S2G. S2G Did he really think you would believe that he had written the essay himself? 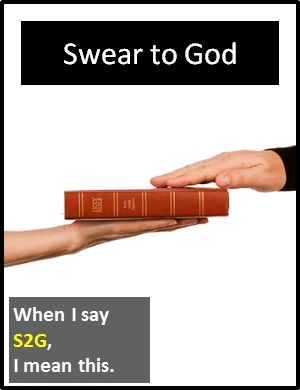 S2G means "I swear to God", which is similar in meaning to "I promise". Person A: S2G I will throw you out of this house if you do not tidy your room. Person A: S2G, let's see if he turns up on Monday. S2G is typically used as an independent clause with the meaning "I swear to God". Before the digital era, we would have just said "I swear to God" instead of S2G.